The Edmonton Buddhist Meditation Group is a small congregation practicing Serene Reflection Meditation under the direction of Reverend Master Koten Benson, Prior of Lions Gate Buddhist Priory. Reverend Master Kōten Benson is a Dharma Heir of the late Rev. Master Jiyu-Kennett, founder of The Order of Buddhist Contemplatives which has its North American headquarters at Shasta Abbey in Mount Shasta, California. The Edmonton Buddhist Meditation Group is a smaller congregation-run meditation group that practices Serene Reflection Meditation. Also known as Soto Zen in Japan and Ts’ao-Tung in China. This practice emphasizes meditation, keeping of the precepts, and compassion. 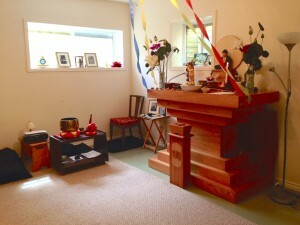 The group operates a meditation hall with an area for tea, Dharma talks, and other congregation activities within a member’s residence. Edmonton Buddhist Meditation Group was incorporated as a Religious Society in 1979. Our practice is Serene Reflection Meditation, known as Soto Zen in Japan and Ts’ao-Tung in China. This practice emphasizes meditation and the keeping of the Precepts within the training of everyday life. Rev. Kōten Benson has been the Prior of Lions Gate Buddhist Priory since 1986. He is a Dharma Heir of Rev. Master Jiyu-Kennett, founder of the OBC, who died in 1996. He was ordained in 1978 by Rev. Master Jiyu, and recognized by her as a Buddhist Master in 1983. The Priory has three monks in residence and is located at Dragon Flower Mountain, one hundred and sixty acres of land in the Botanie Valley, near the village of Lytton in the BC interior. I wish to join your group. How may I do so? Please come to one of our introduction sessions at the Strathcona branch of EPL. Then you may join us weekly for our regular meditation and service. The next instruction session is Feb. 9 followed by one on Mar. 9 both at 10:30 a.m. Come to whichever one you can.